I’ve got a few spreads today from Daniel Bernstrom’s One Day in the Eucalyptus, Eucalyptus Tree (Katherine Tegen/HarperCollins, May 2016) as a follow-up to my chat with Daniel at Kirkus last week. The book was illustrated by Brendan Wenzel. When I read Two Speckled Eggs in 2014, Jennifer K. Mann’s debut as both author and illustrator, I knew I’d found an author-illustrator whose books I’d want to keep an eye on. This book (and Jennifer’s next two books) was right in touch, and authentically so, with the topsy-turvy, always intense feelings of young children. 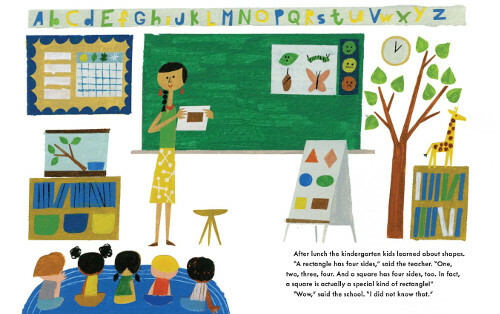 In Two Speckled Eggs, Mann addresses the drama that can be a young girl’s birthday party — issues of inclusion, individuality, and (as the Publisher Weekly review notes) “geek pride.” And in last year’s I Will Never Get a Star on Mrs. Benson’s Blackboard, she sensitively addresses teacher-student dynamics and the vulnerabilities of children in the care of adults in a classroom. This year’s Sam and Jump, released in May, is a tender story of loyalties forged and friendship found. Let’s get the basics from her while I set the table for breakfast. I thank her for visiting. It’s not the first Sunday of the month, which is when I normally feature the work of student or newly-graduated illustrators, but Sara Kendall’s work, which I’m featuring today, is too good to follow any rules. So I’m posting it now. 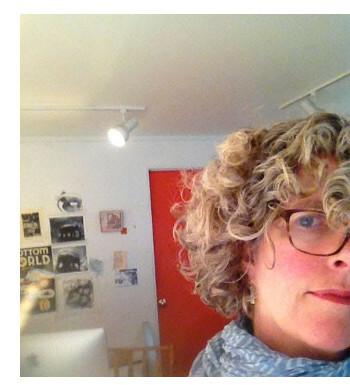 Sara is getting her BFA in illustration from the College for Creative Studies in Michigan and will graduate next Spring. I’m not only featuring her paintings today, but she is also here to talk a bit about her work and future plans. She recently had work in the Society of Illustrators’ Student Scholarship Show 2016 and discusses that a bit below. I thank her for taking the time to visit and share art. Today over at Kirkus, I’ve got Come Home, Angus and contemporary parenting on the mind. That link is here. Last week at Kirkus, I wrote here about Adam Rex’s School’s First Day of School (Neal Porter/Roaring Brook, June 2016), illustrated by Christian Robinson. I’ve got some spreads from the book today. Over at Kirkus today, I talk to author Daniel Bernstrom, pictured here, about his debut picture book One Day in the Eucalyptus, Eucalyptus Tree (Katherine Tegen Books, May 2016), illustrated by Brendan Wenzel. That is here this morning. 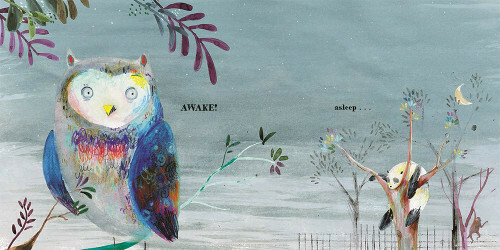 Next week at 7-Imp, I’ll follow up with some art from the book. Photo of Daniel used by permission of HarperCollins. Here’s some art today from Il Sung Na’s The Opposite Zoo, released by Knopf in March. The Opposite Zoo of the book’s title, readers immediately learn, closes when the sky turns dark, but “the monkey’s door is OPEN! Time to explore. …” Here, the monkey visits, on each spread, animals that are opposite in nature (tall, short; soft, prickly; shy, bold; etc. ), and when the sun comes up and the zoo opens, the monkey heads back to his cage. That’s it, in terms of story line. But readers will want to stay for the visually striking, beautifully textured art from Na, rendered (I think) via ink and colored pencils. “With a coloring style that feels as if someone took a firecracker to a box of crayons,” wrote Minh Lê at the New York Times, “Na makes turtle shells as dynamic as a peacock’s plumage.” It’s true. This is art to pore over and enjoy, no matter your age. 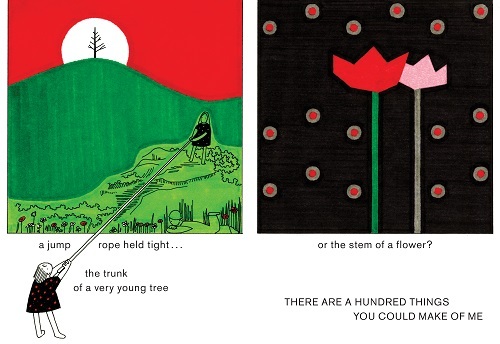 The text is spare; the brightly-colored art with its graceful lines is electric and appealing, making this a book children will want to read and re-read. Sometimes this happens: You see a beautiful picture book and, without thinking things through, you assume it was just released. Then you find out it’s a couple years old. Gorgeous to eye and ear alike, the story’s possibilities are mined beautifully and the reader is left reeling in the wake. 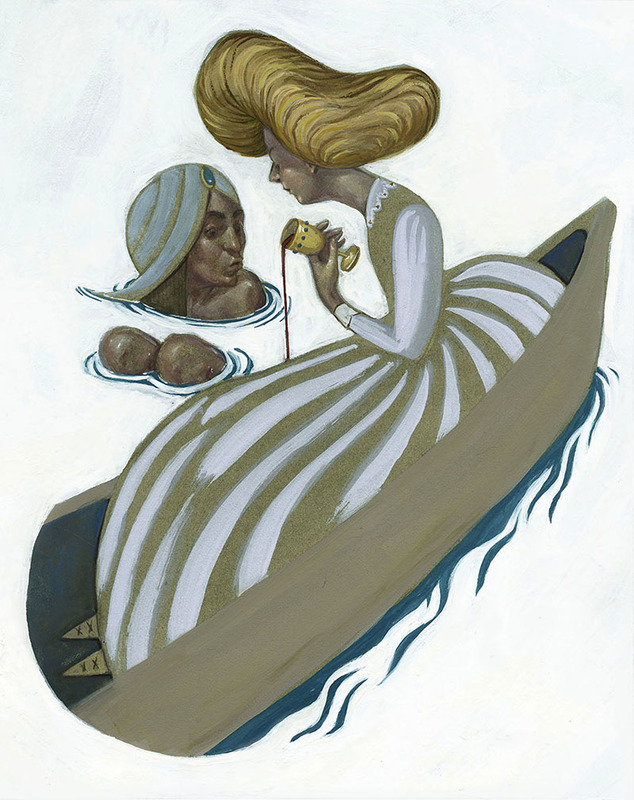 If you’d like a folktale that’s bound to wake you up, this beauty has your number. or the stem of a flower? — From Ann Rand’s and Ingrid Fiksdahl King’s What Can I Be? This morning over at Kirkus, I write about Adam Rex’s newest picture book, School’s First Day of School (Neal Porter/Roaring Brook Press, June 2016), illustrated by Christian Robinson. So good, this one. That is here. Last week, I wrote here about Silvia Borando’s Near, Far (Candlewick, June 2016) and Ann Rand’s What Can I Be? (Princeton Architectural Press, May 2016), illustrated by Ingrid Fiksdahl King. 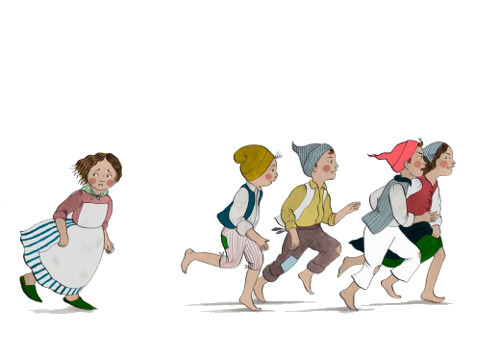 Today, I’ve got a bit of art from each book here at 7-Imp. Last week at Kirkus, I chatted here with John Bemelmans Marciano about his new series, illustrated by Sophie Blackall, The Witches of Benevento. I follow up today with some of Sophie’s art from the books. Today, I have a blog post up at the University’s site, all about my research there. If you’re a fan of James Marshall’s work, you might like to see the rare images up at the post (three of approximately 800 photos I took! ).